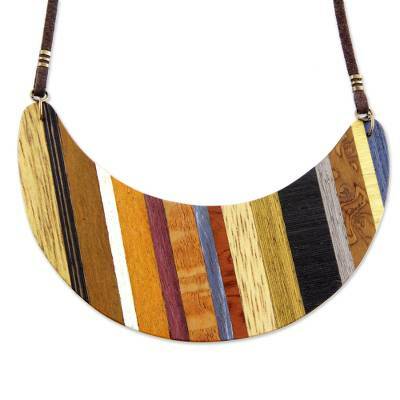 A striped crescent moon hangs from the neck in Brazilian elegance, crafted by members of the Teixera Family. They use an amazing variety of wood types, including a base of mahogany, to achieve the multicolored appearance of this pendant necklace. Finished with antiqued 18k gold plated accents, this adjustable necklace makes a fantastic companion on your journeys. "We recycle vinyl LP records and CDs in wall clocks, which we combine with wood inlay and pyro-engraving. We make jewelry boxes with recycled wood and decorate them with assorted cast-offs." 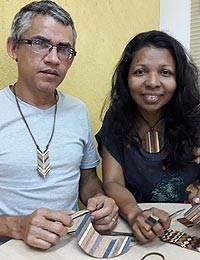 Along with family members, Raí and Ricardo Teixeira craft "bio-jewelry" and décor objects in wood inlay and pyro-engraving. "We left our home of Belém in Northern Brazil seeking new work opportunities and better schools for our little daughter, Sofia," the artisans explain. "In Rio de Janeiro, we continued working in the pyro-engraving technique we had used in Belém. "Our designs had a lot of volume and weight, making it difficult to transport by bus to the Old Rio crafts market to show and sell. 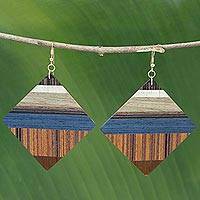 After more than 30 years as an artisan, I've worked in inlay jewelry only since 2014." Raí noticed that the women of Rio are stylish and fashionable. They appreciate jewelry and the family decided to create it. 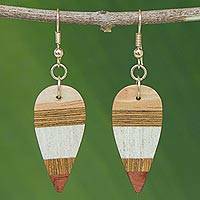 "We began crafting earrings and necklaces with our wood inlay techniques. "We had never done this before and had to develop our own technique and tools. With that, in those two and a half years, we developed and created our line of eco-friendly jewelry and décor accessories. "We use wood from market crates in the structure of our designs and also for our exhibits in craft shows and events. Our studio is set up around these crates, which are discarded from a nearby wholesale market. We recycle old vinyl LP records and CDs in wall clocks, which we combine with wood inlay and the pyro-engraving. We make jewelry boxes with recycled wood and decorate them with assorted cast-offs such as jewelry pieces, old coins, lighters and all kinds of scraps. 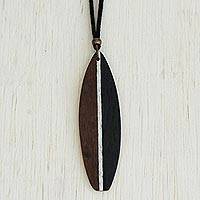 "In our wood inlay, we use recycled woods that are native to Brazil as well as wood types that were introduced from Africa and Europe. Therefore, we like to say our designs have an ethnic footprint. For example, we might synthesize the encounter of the great Amazonian forest with Rio de Janeiro's urban forest. The straight lines in our work derive from the modern architecture of Rio de Janeiro and the curves in our designs are inspired without a doubt by the mountains that encircle the city. "Ours is a family effort. Ricardo cuts the wood, assemble pieces makes collages and does the sanding together with our nephew, Gustavo, who is learning the techniques. Raí is the designer. She waterproofs the wood and creates the montage. Raí's mother helps with the drawings and creating mini-earrings. Raí's father collects materials for recycling, and our niece Maria Alice promotes our work on the Internet. "These designs are our own creations. Our motto is 'Make 100 pieces as carefully as though you were crafting only one.' Quality is our objective — we put ourselves in the shopper's place. Shoppers want to buy things with quality, with a good finish, something beautiful and well made. "When we need extra help, we call in youth from a nearby juvenile detention facility to work with us and have made this a project." Helping people is a theme that resonates with Ricardo. "When I was about 26 years old, I suffered a great existential crisis," he recalls. "Without faith, without a relationship with the transcendent, with the divine, I fell into despair and thought about ending my own life. I needed something crucial, a foundation, and at that crucial moment, it was as though a voice spoke to me. 'No! Don't give up. Keep moving ahead!'" "At that moment, I decided to take to the road. I traveled across the country in search of something new. For the first time, I stood before God and prayed. For six months, I traveled, sleeping in plazas and doorways, in an encounter with God and self. Along the way, I met wonderful people. "Brazil's economic crisis has affected us a lot, so today we are focusing on reaching markets in the US and perhaps Europe. To do so, we are better organizing our crafting process, reorganizing the workshop and buying the tools we lack." 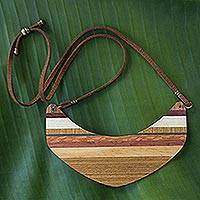 This item was handmade in Brazil by NOVICA artisan borrowers. Kiva lenders have helped these artisans stock up on materials, buy more tools and grow their businesses.